Changing a new born baby’s diaper is a very frequent task that most parents, particularly mothers have to perform. Throughout the day, as well as the night, newborns tend to soil diapers much more frequently than older children. And if you have a changing table that is at the other end of the nursery (or room) then you have to each time pick up your baby from the crib, carry him or her to the changing table, get the supplies, do the change and then bring them back to the crib. And while for one change or two this doesn’t seem like too much – in the long run, it can be back breaking work! 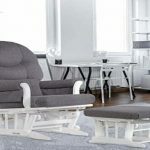 So to make life easy for you, we have brought you a few picks for crib and changer combo sets. 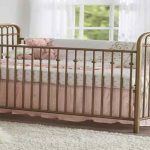 As your baby grows, the crib converts into a toddler bed, day bed and finally a full size bed. 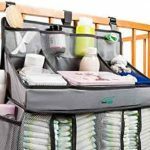 The changing table is very well built and can be used to store essentials for years. The drawers are a great addition. 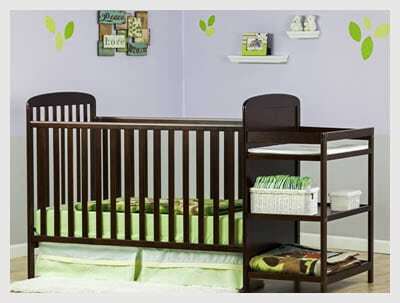 The crib and table are very well designed and super easy to assemble, including the drawers. 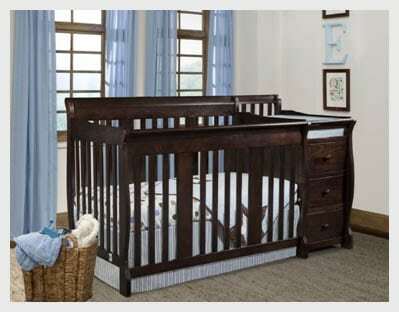 The wood used is of the best quality and free of any odors that may make your baby uncomfortable. The entire set is sturdily constructed, which means that it will indeed last you for years. And that isn’t all – there are many other reviews with personal experiences and opinions that you can check out before deciding. And once you do, follow this link to order it from Amazon! 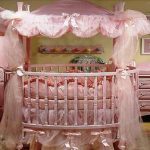 This crib too converts into a daybed for your baby as he grows into a toddler. The changing table is detachable and can easily be retained as a functional shelf in the nursery. Assembly of this crib is also easy, and particularly so because it doesn’t come in too many pieces. In fact, many people managed it even without the instruction manual. 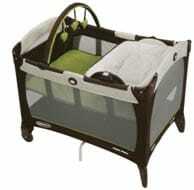 This bed is also quite sturdy and well built, something you will definitely appreciate as your baby grows. So if this is more fitting for your budget, then go ahead and order it today. And if you want some more insight into this crib, you can always go and check out the reviews. Again, a very easy crib and changing pad combo to set up. Most parents were able to assemble it without much trouble. This one is also very easy to transport with you – even if you are traveling or going for a holiday, since it folds up into a small package! The changing table comes with special wipe able fabric cover – making it super easy to keep clean. So, if you want to watch your budget, and yet get a very good quality crib and changing table for your baby, then do consider this. Also, go and read through the reviews for greater information today! 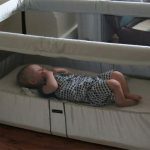 As you saw, there was something in most price brackets, so whether you want to spare no expense, or you are working within a tight budget – there is a crib and changer combo for everyone! So now, you just need to take your pick, order it and then wait for Amazon to bring it to your home!